Successfully Added ESCAM QF200 IP Camera - 960P, Micro SD Support, Motion Detecion, Night Vision, Wireless, AP Hotspot to your Shopping Cart. 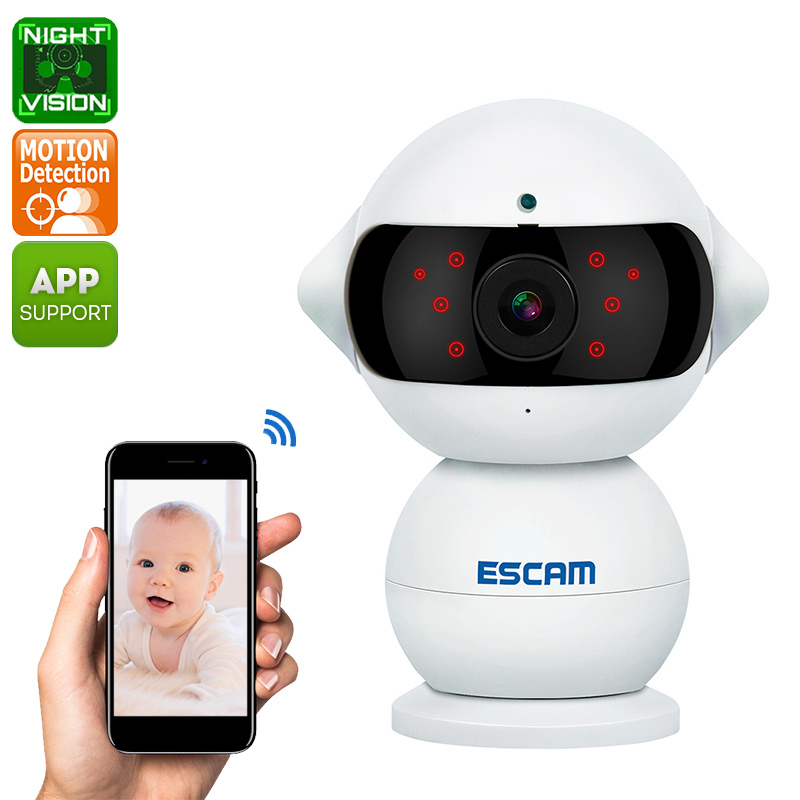 This cute little camera from ESCAM is a smart security device that is shaped like a robot. It has a spherical body and head that is held in place by a magnet. The base also has a magnet so you can easily mount it on metal surfaces. The ESCAM QF200 has a 1.3 MP CMOS sensor that can record footage in 1280x960 resolutions. Thanks to its clever design the head can be rotated through 360 degrees and it can be mounted to cover just about any angle you require. Connect this IP camera wirelessly to your router and view the footage through your smartphone or laptop computer by accessing it through the internet. Alternatively, use the AP hotspot for access when you don't have a router available. With support for 64GB micro SD cards, this min robot IP camera can be store plenty of footage locally. It has 2-way audio as well so you can converse through the camera with family and visitors in your home. The camera also supports motion detection and has an alarm function to send notifications to your phone. It can even be sued as a baby monitor which can be remotely accessed through your iOS or Android smartphone. so you can keep an eye on the kids while you work. This mini wireless IP camera comes with 12 months warranty, brought to you by the leader in electronic devices as well as wholesale security gadgets.